A Yorkshire MP has warned that upgrading the A1 will lead to an increase in noise and traffic problems in a town centre. Contracts will be awarded to companies to carry out the work on the road between Wetherby and Walshford, and between Wetherby and Bramham. But Colin Burgon, the Labour MP for Elmet, told the House of Commons the scheme would create extra traffic in Wetherby. He said: "The layout of the town was built in another era and it is certainly not suited to 21st Century traffic laws. "If all the slip roads to the A1 are removed as part of the upgrading work, then traffic in the town centre will increase." Mr Burgon had complained that the M1-A1 link road, which opened in February 1999, was too loud. 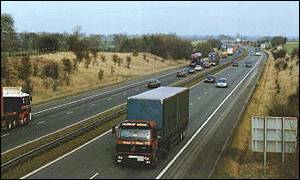 But Roads Minister David Jamieson said noise would not be a problem with the latest improvements to the A1. He said: "Noise barriers will be designed to suit the conditions at each locality. "They may not always meet the needs of local residents but we will consult further with interested parties." When all the work to the A1 is completed, there will be 60 miles of three-lane motorway running from Ferrybridge in West Yorkshire to Barton in North Yorkshire.